Arrival in the Port of Ashdod, Israel for an overnight stay. We were most excited to arrive in this port as the next two days were to be filled with adventures to Jerusalem, Bethlehem, the Dead Sea & Masada. Today, our adventures would lead us to the historical Jerusalem and Bethlehem. This tour was arranged by a fellow Cruise Critic member and was shared on the roll call. As we had signed up for the cruise late in the game, we joined someone else’s organized tour versus trying to venture out on our own and build another small group. It was only after I had joined this tour that I had found Udi & Keppy (Haifa, Israel Guides) and I will miss them. This tour was very good, but Udi is one in a million and if given the choice between the two companies, without hesitation, I would recommend Udi. My choice is nothing against the guide that we had for the next two days, he was very good! – however, Udi is just a very special person that puts him above the rest. Pretty much we followed the above, although we saw Bethlehem first and then went to Palestine which was a better schedule than proposed above. If I can have any suggestions for travellers, it is to request an earlier start time from the Israeli ports. You will beat not only traffic, but crowds. Our group decided for Day 2 to start earlier (7 votes to 1 – LOL) and this was helpful. Clueless as I was regarding the state of Israel & Palestine, our guide Ofer delivered a very good history lesson as we embarked on our long drive towards Jerusalem & Bethlehem. I had no idea that Bethlehem was in Palestine (my own ignorance as a traveller) and further more, didn’t know we had to enter a demilitarized zone and go through security/customs to visit this holy site. 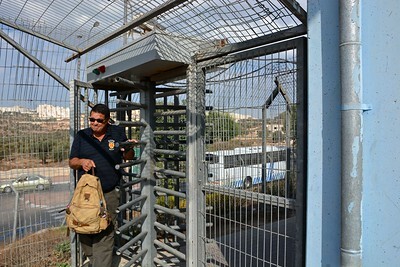 Furthermore, our guide based on his nationality & religion could not enter Palestine and we were dropped off at the “gates” and were told to meet our guide on the “other side”. I went a little pale at that moment. We trusted the process, went through the gates, came out the other side where a van was waiting for us with a “Johnny’s Souvenir Shop” sign on the dash. Hmmmmm. We asked if he were our guide and his reply was, “No, I am just your driver”. I was thinking, this is just getting better and better! Our driver drove us around Bethlehem as he was saying our guide had not arrived at the site yet … OYE! seriously? Well? 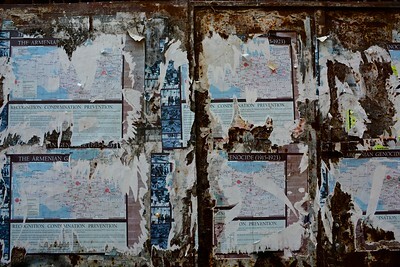 at least we got to see a little bit of the town of Bethlehem. After what seemed like an eternity, we got the phone call, the guide was ready. We were dropped off close to the “Church of the Nativity” and our pulse rates began to return to normal. Although Anthony & I are not of the Christian faith, we do appreciate the historical significance of the Church of the Nativity and were appreciative to visit this site of pilgrimage. 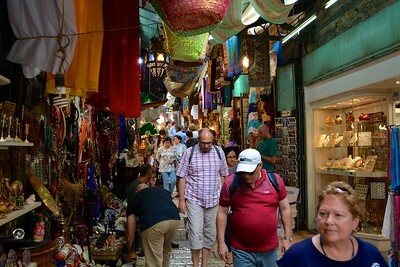 Following our visit to the Church, we were then whisked off to “Johnny’s Souvenir Shop” to do a little shopping prior to our return to Jerusalem. The return trip through the border control was just as interesting (if not more!) than our initial entry. Our guide, Ofer, was thankfully waiting for us on the other side. Once we were reunited with our original guide, we then drove to the Tabachnik Garden – a national park which is located on the southern slopes of Mount Scopus, next to the Hebrew University. The main part of this ridge, bears the name “Mount of Olives”. The “Mount” has been used as a Jewish cemetery for over 3,000 years and over 150,000 graves can be seen covering the sides of the mount. The gardens gave us a lovely view of the “Temple Mount” which we would not be visiting today (restricted access). The Temple Mount is the holiest site in Judaism where it is believed that God’s divine presence is manifested more than any other place in the world. It is believed that it is here that the world expanded and where God gathered dust to create Adam. From the Mount, we travelled towards the new city of Jerusalem where we parked the van in a modern underground facility and then took the elevator up to an equally modern shopping plaza with designer shops. We walked through the plaza towards the gates of the Old City which is surrounded by a fortified wall. The city within the walls is divided into four quarters, off of which we visited – Christian, Muslim, Jewish, and Armenian. The quarters seamlessly flowed from one into the next, with the only exception being the entrance to the Western Wall plaza, that for obvious reasons had very strict security control. Christian Quarter: the Christian quarter within Jerusalem’s Old City walls is very important to Christianity. 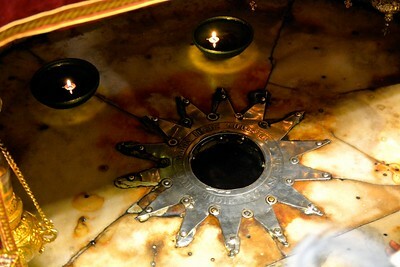 It is believed that here is where Jesus Christ lived and died. One of the most significant religious buildings within the quarter is the “Church of the Holy Sepulcher” where you can find the anointing stone (slab on which Jesus’ body was laid prior to his burial) and Jesus’ grave. Millions of Christians from around the world travel to this pilgrimage site and it was very busy! The Church is at the end of what is known as “Via Dolorosa” (Way of Sorrows) which according to Christian faith is Jesus’ final path where he was led from the courthouse to Golgotha Hill, where he was crucified and buried. 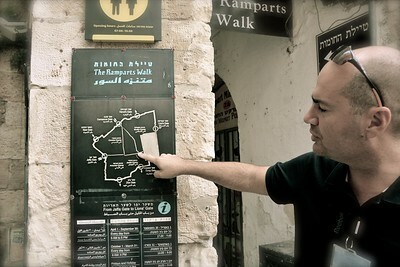 There are 14 stations along the path, which as mentioned above, needs at the Church of the Holy Sepulcher. Muslim Quarter: as we moved along, we found ourselves blending in from the Christian quarter to the Muslim quarter. The aroma of spices were evident as you walked through the narrow, cobblestone pathways of the old city. It is within this quarter where we stopped briefly for a short lunch and indulged in a dish of Falafel and side salads. Jewish Quarter: as we entered the Jewish quarter (again a seamless transfer), we approached the guarded Western (wailing) Wall. We went through a security check point (bags scanned, etc.) 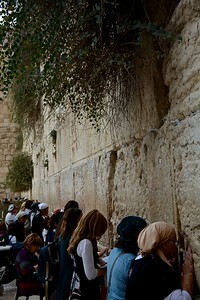 and we entered the “Western Wall Plaza”. It was an interesting visit as on that particular day and time, an “Israeli Guard Graduation Ceremony” was being conducted. So on one hand in the centre of the square, there were hundreds of Uniformed Guards surrounding rows of tables laden with heavy machine guns and then in the backdrop, the holy site of the wall where people were offering their religious prayers and notes of deepest wishes, embedding them into the ancient crevices. It was a stark contest of “Religion and State” within the same area. Following our visit to this iconic plaza, we left the area and continued our tour. Armenian Quarter: the Armenian quarter seemed like a more quiet and reserved area. Again, seamless transitions between one area to the next, but this quarter, located in the south-western corner, did not have the hustle and bustle of the previous areas. One thing to note in this small, quiet quarter is the ceramics that adorn the houses and street signs. Armenian ceramics from the old city are well known for their quality and craftsmanship. Jerusalem is an incredible city to visit. The diversity and co-existence between the four quarters will be remembered for a life time. I could easily see spending a few days here to explore the quarters further, but the day trip with our guide Ofer, was well spent and we all learned a lot from a city that offers unique sites and flavours within each quarter.